Can’t make it to the big game? 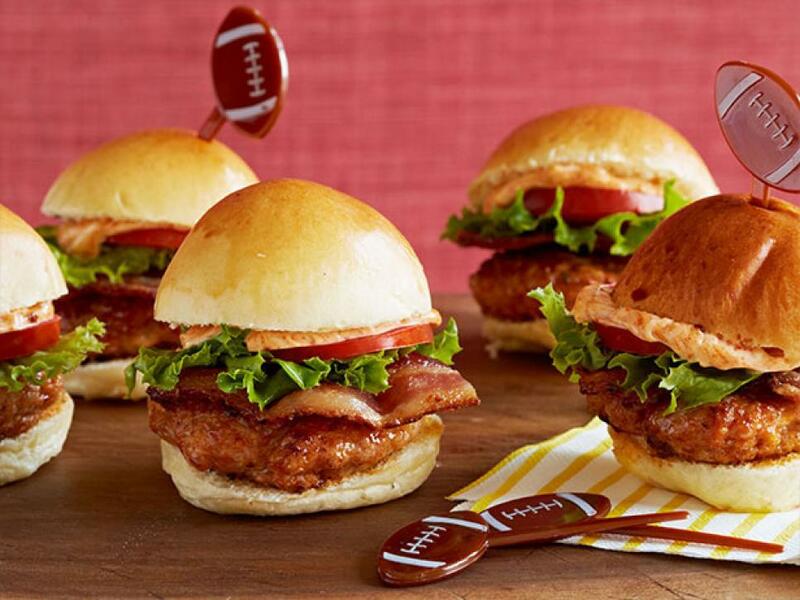 The only thing better than watching a football game – is watching it with friends and family – while eating tasty food. 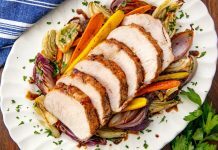 Most watch parties are buffet style – where guests serve themselves from a variety of dishes set out on tables or counters. However, this type of food service, where food is left out for long periods invites bacteria that can cause food illness. 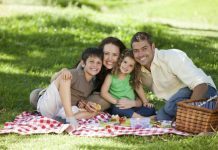 Follow a basic food safety playbook to keep your football watch parties both fun and safe. Arrange layout for guests. Arrange furniture to avoid clutter and create a clear path to the bathroom and snack table. Let your neighbors know. If you live in an apartment or condo – let them know you will have guests and the noise may be loud. Invite them also. Test your technology. Make sure your TV and speakers are working perfectly – and don’t forget new batteries for the remote. Inspect your kitchen appliances. Make sure your all appliances are in safe working order. Understand host liquor liability laws. Pace yourself and notify friends – if your game plan includes serving adult beverages. Most states hold party hosts responsible for what guests end up doing behind the wheel. Serve plenty of food and non-alcoholic beverages, and don’t hesitate to arrange a designated driver. 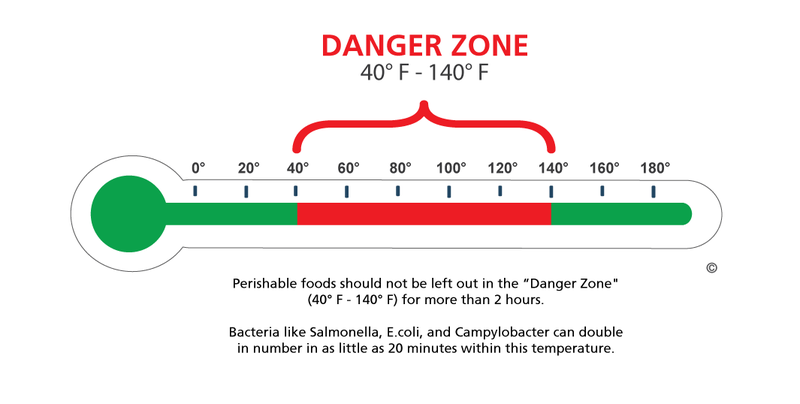 Leaving food out too long at room temperature can cause bacteria to grow to dangerous levels that can cause illness. Bacteria grow most rapidly in the range of temperatures between 40°F and 140°F, doubling in number in as little as 20 minutes. This range of temperatures is called the “Danger Zone”. 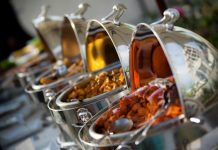 Offer guests serving utensils and small plates to discourage them from eating directly from the bowls with dips and salsas. Food Thermometer. 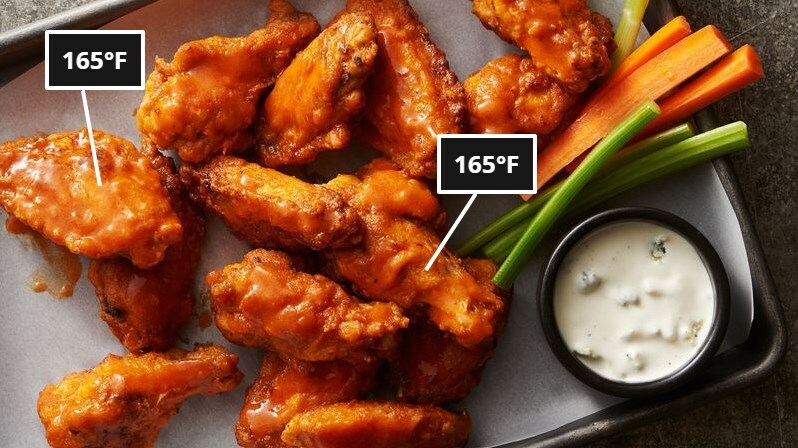 Use a food thermometer to test football party favorites, like chicken wings and ground beef sliders, or any other dishes on your menu. Divide cooked food into shallow containers and store in a refrigerator or freezer until the party begins. This encourages rapid, even cooling. 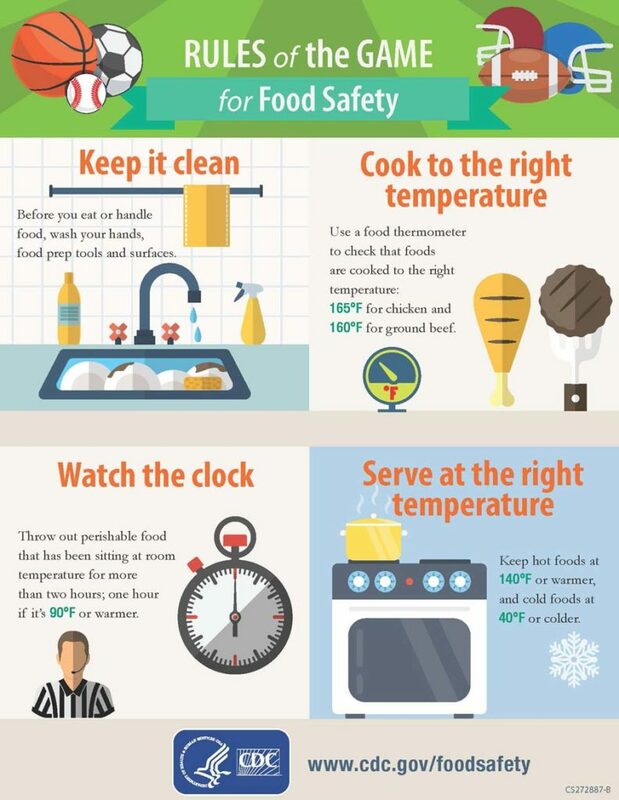 Refer to the Safe Minimum Cooking Temperatures chart below for the proper cooking temperatures and “rest time” of meats—the period after cooking that some meats need to rest before serving to ensure that germs are killed. 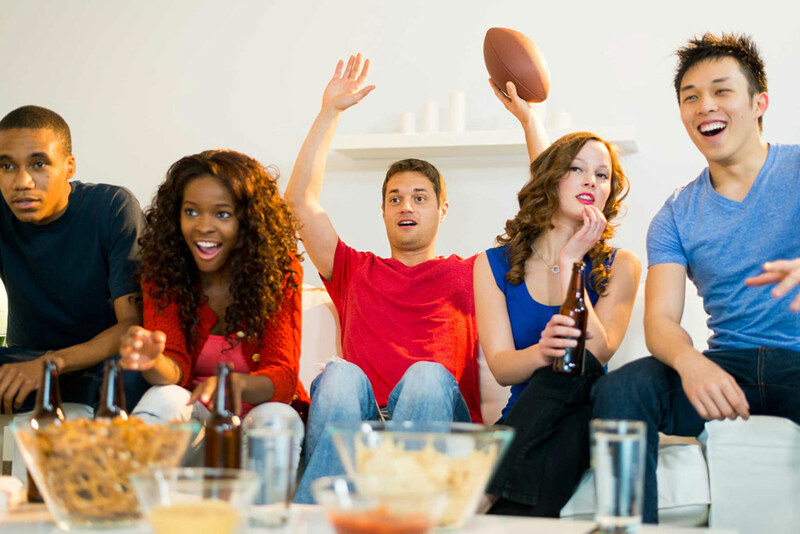 Don’t let your football watch party be remembered for a food illness penalty. 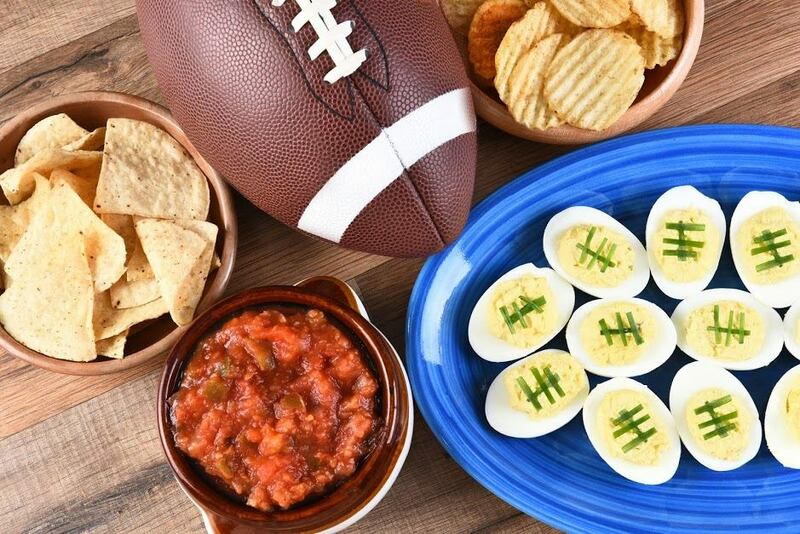 Follow a food safety playbook to help keep your football party food both safe and delicious!